And this is how a unicorn led me to a mermaid. Thanks to my niece’s unicorn birthday card, I got in a few more custom card orders. One of those was for a special mermaid birthday card. I get the craziest ideas in my head sometimes, without any inkling of how I’m actually going to accomplish them. And then, through trial and error and time and SMH-at-myself moments, eventually they come together–and hopefully I’m even pleased and kind of impressed that the whole thing didn’t flop. Such was the case with the mystifying mermaid. I could see it in my head–a cute little mermaid on the outside of a wooden ship, peering through the porthole to see what she could see, much as I imagine Ariel would have done had she not been collecting artifacts in her grotto or spying on the dancing taking place on the deck of Prince Eric’s ship. The trouble was that I didn’t quite think through all the steps of just how to create it. The ship wouldn’t be a problem to create, as I own the Stampin’ Up Hardwood stamp (current catalog) and the porthole and mermaid were only going to be so big (I didn’t have to create the entire ship). 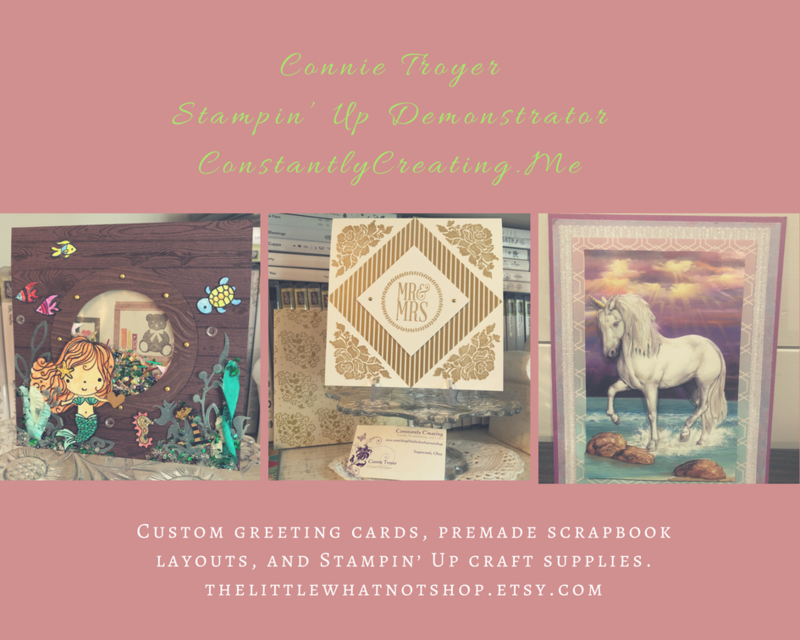 I began by cutting down a piece of Stampin’ Up Chocolate Chip (retired) cardstock to 6″x12″, scored it 6″ up, and folded it. (And then shortly thereafter I cut down that card base to 5.5″x5.5″.) I used SU Early Espresso ink (current) to stamp overtop the Chocolate Chip so the wood grain could be seen. I then looked at several circle dies on my die wall and decided that the double-circle die from SU’s “Sliding Star” Framelits (retired) had the spacing I wanted for the porthole. I centered the die on the now-smaller card base, put another piece of cardstock behind the card base so the marks in my die-cutting plate wouldn’t transfer to the inside of my card base, and ran it through (forgetting until then that the die would cut through both the base and the extra piece. Oops! Goof #1!). Once I had the hole cut into the card base, I had to make the porthole cover, which would need to extend over the hole slightly. I went back to my Chocolate Chip cardstock to find a remnant that would fit, placed the die on the paper, and traced around the inside circle. Then I grabbed one of my most favorite and very old tools (a layering tool from Stampin’ Up from waaaay back), put the smallest layering circle against the die, and dragged it around the die with a pencil through the center of the layering circle (it rolls around objects to make slightly larger mats). Then I cut the now-slightly-larger circle out of the cardstock by hand. Once I had both circles cut, I embossed the new porthole with a wood grain embossing folder, decided I wanted the debossed side up, marked where the mini brads should go, punched the necessary 1/16″ holes (it’s easier than forcing brads through the paper by hand), and placed my chosen brassy mini brads in their spots. And then I glued the porthole onto the card base. But that still didn’t get me the shaker feature. And that’s when I realized that I was once again taking the hard road by not doing the way I already know (albeit not well). So I conferenced with my friend E, who happened to be on video chat with me while I crafted (there are some days I love technology!). And she proceeded to explain to me how to use my much-desired Fuse tool that I’d purchased, longed to use, put off using, and then started looking at in a rather intimidated fashion. Apparently one can make shaker pockets with a Fuse tool! I’d heard that somewhere but had never attempted it. And fortunately for me, I’d happened to find some Fuse Project Life pockets on clearance the last time I went to JoAnn Fabrics. Even better, I found them in my craft room without too much looking. While the Fuse warmed up, I revisited the shaker elements I’d gathered a few days prior–different colors and shapes of sequins (the stars reminded me of starfish, and the gold, clear, and rose were the perfect shades); seed beads in clear and marine colors and clear Stampin’ Up microbeads (retired) for space in the shaker pocket; leftover gold, green, and red long confetti flakes from a Stampin’ Up card kit; gold, white, and green mica flakes (that I’d never tried using); gold glitter hexagonal flakes; and some white Rock Candy Distress Glitter from Ranger. I spooned various quantities of these things into the pocket–and put in too many (goof #3? )–but actually managed to work the Fuse tool correctly on the first try. The second try wasn’t as good, but I’ll practice now that I’m no longer scared of it. 🙂 I cut away the excess of the filled shaker pocket and asked E how to hide the thing in the card. Since I wanted my mermaid to be looking at something inside the ship, I cut a large circle in a lighter color and stamped the background of a bookshelf and human objects with SU Bookcase Builder (retired), which would be seen through the shaker pocket; then I glued that to the back of the acetate piece in what I hoped would be the right position (since the shaker elements would and did move around). Then I took another remnant of Chocolate Chip cardstock, placed foam dots around the edges, and put it overtop the background and shaker pocket. And then I breathed a sigh of relief, because the thing actually shook around the way it was supposed to, even if I did probably put too much in it. I was hoping it would look like the outside of the porthole had collected some sea stuff there on the ledge as it moved through the water…but Miss Mermaid got what appears to be the amount that collects in a shipwreck! Oh well. Live and learn and stuff another envelope later. So my porthole was done–and I’d previously colorized my little mermaid and her friends with watercolor pencils, an Aqua Painter, Adirondack Dimensional Pearls, Stickles, Nuvo Glitter Drops, and Distress Glitter Stickles. I’d actually tried to stamp her tail on some very nice flaked cardstock that reminded me of scales, but that didn’t work like I’d thought it would (and I should have known better anyway–another goof), so watercoloring and two layers of glitter glue ended up working for the tail instead. I fussy-cut them all out, glued the mermaid to the card front in between two of the mini brads in the porthole, and started trying to figure out my seaweed issue. In my head, I saw things floating near her on the outside of the ship, like her friends or the occasional sea life. I ended up with more things there than I’d intended, but I think it’s cute anyway. I found some retired Stampin’ Up ribbon in Emerald Envy, Pistachio Pudding, and Coastal Cabana that was ruched or ruffled, so I thought that might work for seaweed. I didn’t think I had any seaweed dies or stamps–but I found dies that would have worked better after the card was done (goof #5). Too late. So I trimmed up the ribbon (cut some of it in half and twisted others) and found some greenery dies on my wall that I thought could pass for seaweed. I used a couple of miscellaneous green vellum sheets of paper with the dies and then attempted to glue them all together with Zots and Tombow Multi (green and white) Glue. But I couldn’t stop there. I had to add beads and microbeads and mica flakes to the outside bottom edges too. The inside of the shaker can’t have all the fun. Plus, I was hoping to hide some of the glue marks on the vellum pieces. 😀 I also found a little gold heart die-cut for the mermaid to hold, a gold compass for the inside of the card, and a black-and-gold die-cut anchor piece inside a random pack of travel/beach die-cuts I’d just received. I let it all dry overnight but had to go back in the morning, shift a couple of things, and reglue. My twisted seaweed had righted itself, and one of the taller seaweeds I’d cut by hand was tilting precariously. I probably spent far too long on this card, but it was fun to work with the vision I had in my head and see it all come about. Now I just have to hope that the little recipient doesn’t shake off all the beads immediately!